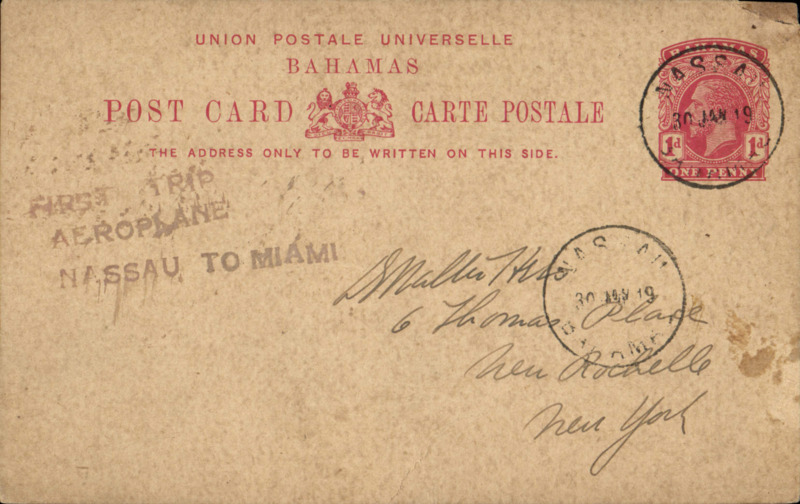 Nassau-Miami flight, three-line handstamp cachet "First Trip/Aeroplane/Nassau to Miami" on Bahamas 1p postal card to New York, Nassau Jan. 30 c.d.s. Small non invasive corner bend top rh corner, repaired verso. 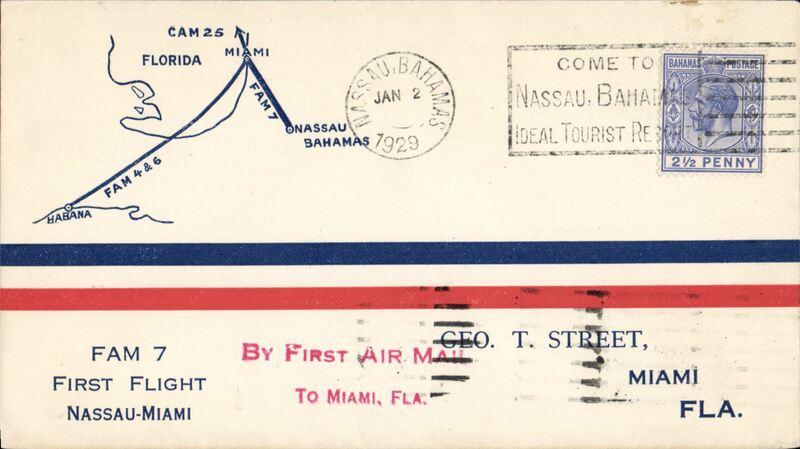 F/F, Nassau-Miami, bs 2/1, printed souvenir cover franked 2 1/2d, red two line cachet 'By First Air Mail/To Miami' cachet, Pan Am. Image. 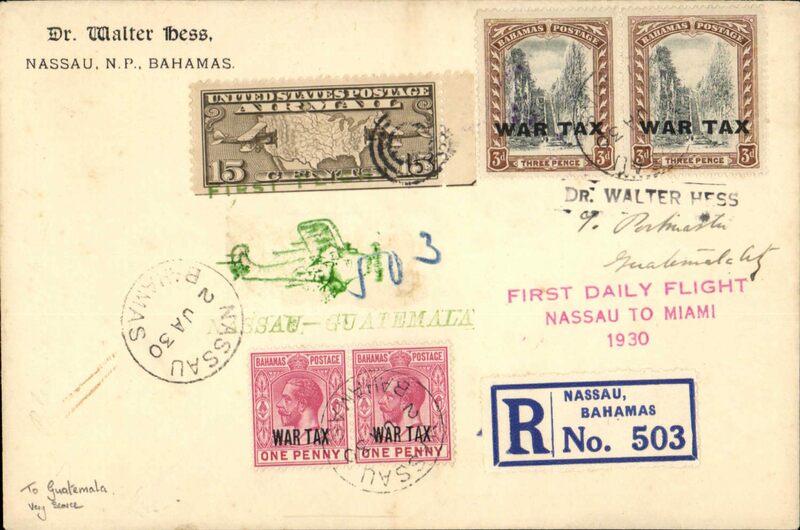 Very scarce acceptance from Bahamas for Guatemala, bs 9/1, for carriage on F/F FAM7 Resumed on Daily Basis service from Nassau to Miami where US stamp was affixed for OAT to Guatemala on FAM network, registered (label) Walter Hess corner cover dual franked Bahamas 2x1d & 2x3d War Tax opts, canc Nassau 2 Jan 30 cds, and US 15c C8 postmarked with dumb cancel, violet Miami/Jan 2/1930 double ring cds verso, red three line "First daily Flight/Nassau to Miami/1930" and green two line "First Flight/Nassau-Guatemala" flight cachets. 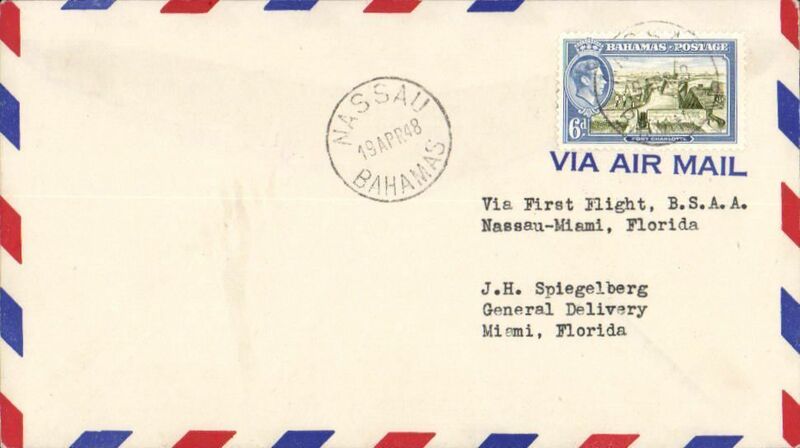 Bahamas acceptance for return of LZ129 Hindenburg, 1st North America flight, Lakehurst to Germany, b/s Frankfurt (Main) 14/5, franked 3/3d canc Nassau cds, violet US Lakehurst-Frankfurt flight confirmation mark. 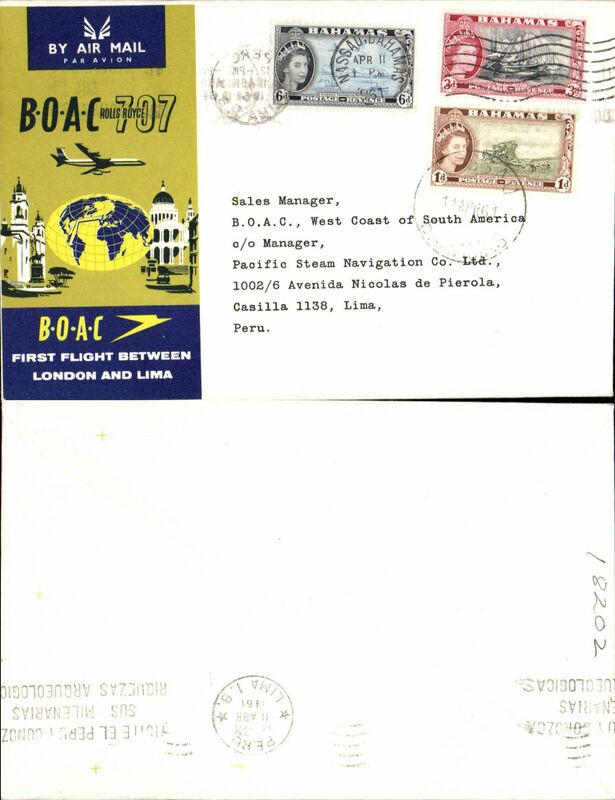 Uncommon acceptance, only 2 flown. 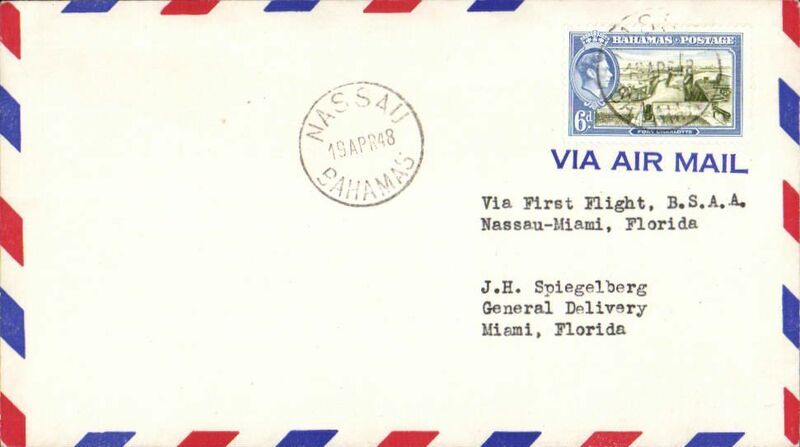 British South American Airways, first flight, Nassau to Miami, bs 20/4, airmail cover franked 6d, typed "Via First Flight, B.S.A.A./Nassau-Miami, Florida" Ilustrated Beith R., p25. 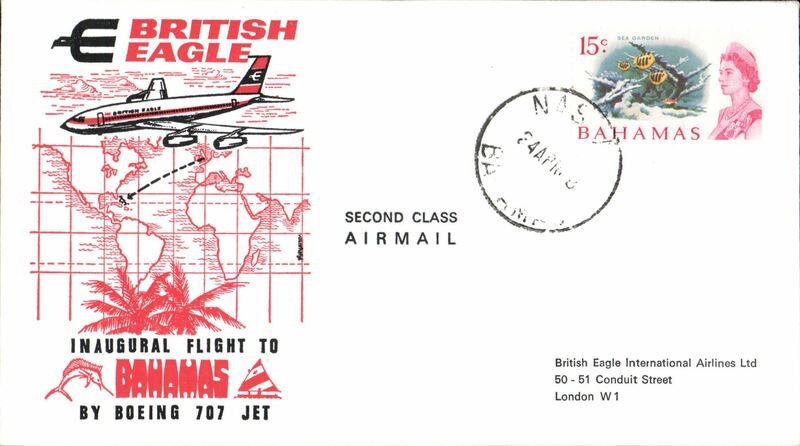 British Eagle F/F Boeing 707 Nassau to London, bs 4/5, souvenir cover franked 1/6d. Image. 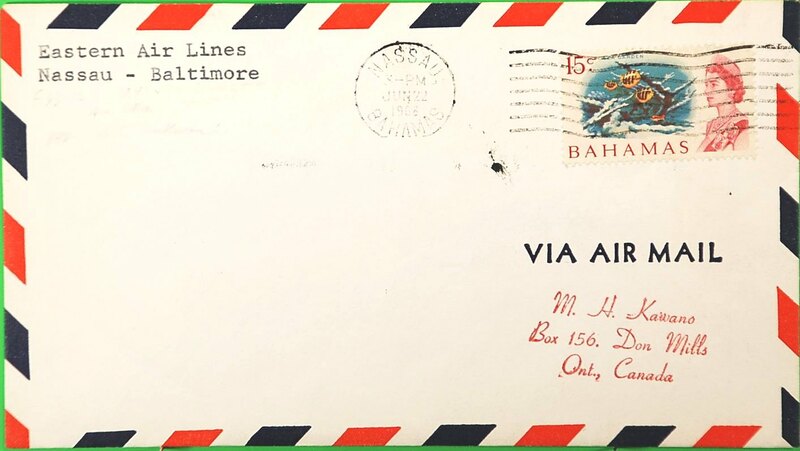 Scarce F/F FAM 33, Nassau to Baltimore, no cachet, no bs, air cover, Eastern Airlines. 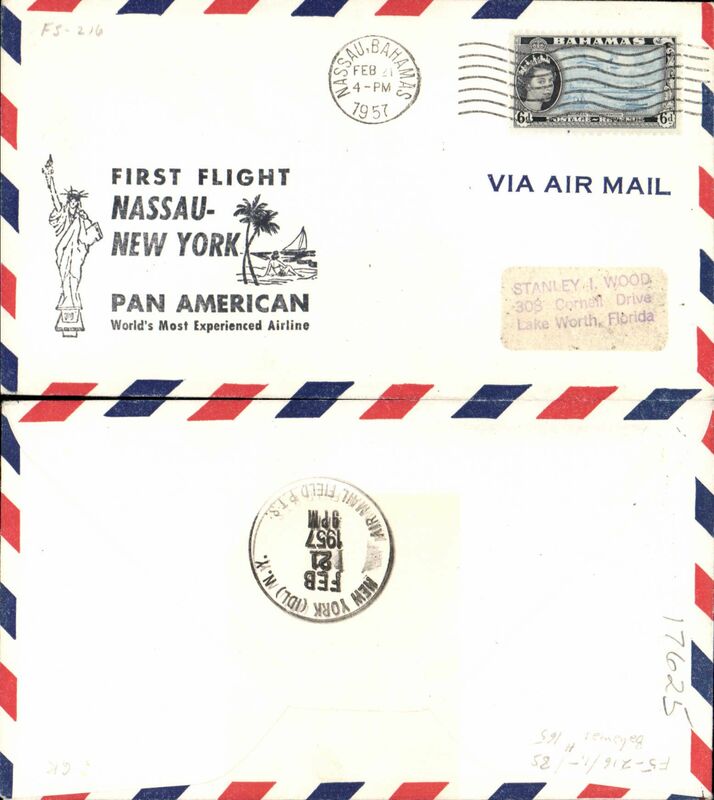 It is reported that none of the 19 covers actually flown were back stamped by the Baltimore PM because "no proper cachet had been used". 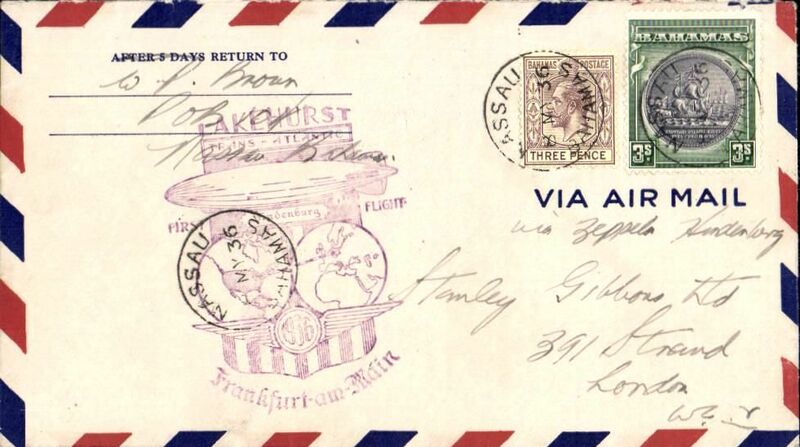 Only 19 flown. 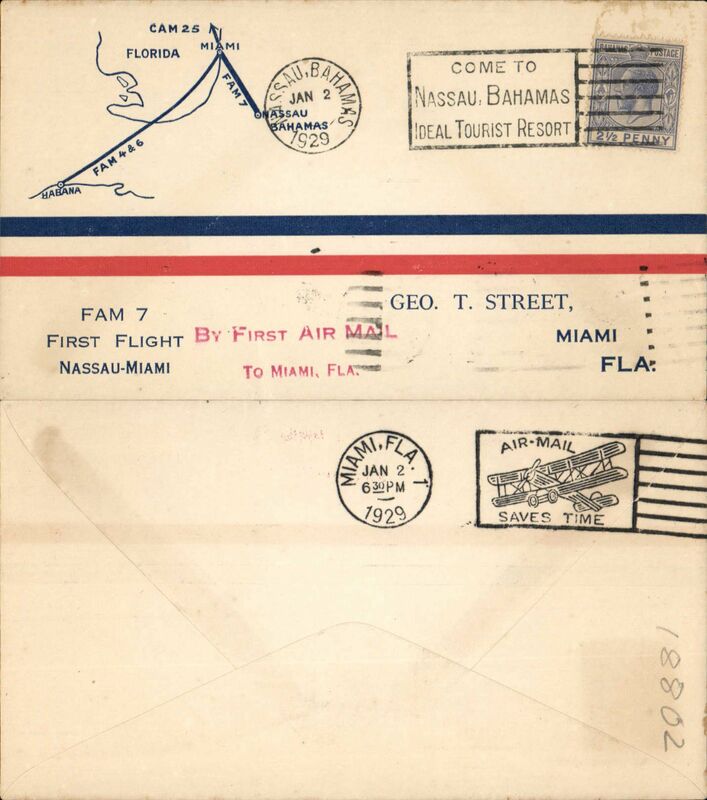 FDC, franked 50th anniversary set of two,1st flight from Nassau, Bahamas, to Miami, Fla., Jan. 30, 1919.